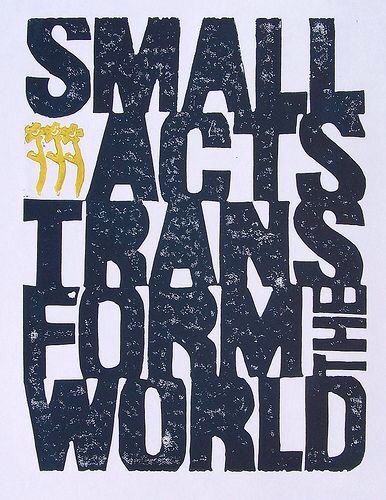 Think Thursday: Small Acts Transform The World! Yesterday was Earth Day which is where events worldwide are held to demonstrate support for environmental protection. It doesn’t have to be a one day event, it can be Earth Day everyday. Let’s continue to protect the earth by considering small changes in our lives that can make a difference such as donating, reusing and recycling items before throwing them away, by closing water taps while brushing your teeth, turning off the lights when not in use and walking, cycling, car pooling or using public transportation. It’s by small and simple things that great things happen. Every small but caring act that a person can accomplish makes an impact which is a piece of the puzzle to transform the world. Together, we can make a difference!